$1.19 to $79.99 & FREE Shipping on orders over $59 $35. Magnum is a great bittering hop with an aroma similar to a strong Willamette. 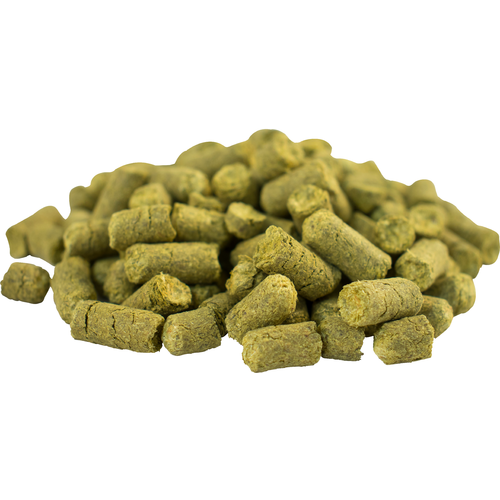 It therefore works well with Willamette, Fuggles, and British Kent Goldings when used as an aroma hop in later boil additions. Magnum makes an incredibly useful bittering agent in just about any beer, and due its very smooth bitterness, you can really use as much as you want. For example, we use two full ounces in our 60 minute IPA boil. It has a great storage stability too, so stock up! I am putting together a large batch of Belgian Dark Strong Ale according to a recipe I'm fine-tuning, and these are the hops I most like to use with it. For me the best all around bittering hop. For just a hint of hops. great hop always fresh from more beer. They seem to be exactly right for making Belgian ales - completely anonymous, with just enough presence to give a backbone or structure to my Belgian Dark Strongs, etc. My go-to buttering hop. It lasts forever and bitters beers well; firm and obvious but not overwhelming. I rarely use anything else. Used this hops for bittering, produces nice clean bitter flavor. My go to hop for bittering. Great bittering hop; similar to Northern Brewer, but higher alpha. Said to be used by Stone in many of it's beers. I basically use Magnum almost exclusively for bittering. I like it so much I am going to make a straight Magnum IPA. As others have said, great bittering hop - never tried for flavor or aroma. Good hop for most beers. I put this is my stronger beers to give them a solid hop backbone but not too much. I save my top self hops for IPAS! Use this in a red or stout/porter. You won't be dissappointed. Not good for much else, but really great for bittering. Use the magnum, a great bittering hop. Packs a punch in AA! My favorite two style of beer to brew are European lagers and hoppy American ales. Magnum is my go to bittering hop or both. Why?... it's high in alpha acid meaning I need less in my bittering addition to get the IBUs I want. And less hops mean less hop matter to avoid running off into my fermenter. Magnum is also a very clean or neutral bitterness. Sometimes when bittering with trendy high alpha hops like Citra I find a harshness to the quality of bitterness that detracts from the malt backbone and can even distract from the late hop/whirlpool hop additions typical in American IPAs and Pale Ales. So save up those Citras for your hop bursting technique and bitter with some good ol' Magnum.